For Locks to Open, Replace, Change and Supply, call 020 8800 6041. Are you looking for a Security Company to Open, Replace, Change or even Install new Locks, as well as buying, repairing and making keys for them, when keys are not available? Here at our shop base in North London, where we have been established for more than 35 years, we do all that plus more. If you do not live local to us, you can send your units or cylinders, by post, to us, and we will repair it or rekey it. Need any advice on Locks, or prices for work to be undertaken and you are on a mobile unit, click on the link below to be diverted to our Locksmith team. FOR KEY CUTTING, REPAIRS, REPAIRS, MASTERING AND PASSING, UPVC UNITS PLUS MUCH MORE. If you are looking for a premier Security Service to OPEN....REPLACE....CHANGE....FIT....REPAIR....MASTER AND PASS either at our shop base or to your premises, then look no further than our Company The Number "ONE" Security Company, covering the whole of North London, North West London, The Home Counties and areas local to these. Our Company has been established, at the same premises for the past 35 years, therefore you know you are dealing with an established business, which will not let you down. This alone must give you peace of mind. Our Engineers know all there is to know about the standard devices and will always advice on what Security device is needed and where, whether it is a door or a window security device, to pass Insurance standards. Our fully qualified Carpenters know how to fit all types of security devices properly. Our team are happy to give an estimate, if you need one to Open, Replace, Change or even fit. Just go to the form at the bottom of the page below, to go to our estimate page, or telephone 0208 800 6041 to speak to a member of our staff, WE ARE NOT A CALL CENTRE They would be happy to give a fair estimate for any work you need undertaking. REMEMBER!!!! We do not charge a call out fee, we only charge what you where quoted, when contacting our office, plus parts, subject to being given the correct information. WHAT DOES OUR COMPANY DO WITH LOCKS? We Open them:- When keys are lost or have been stolen, misplaced or has a fault, our Master Locksmiths will come and Open them with minimal if any damage. We will always try and open with the non destructive method, first. We Change them:- When keys have been lost or stolen, or you are moving into a new property, it is always advisable to replace your units with new ones. We make keys to them:- When keys are lost to old security units, car doors or car ignitions, we make new keys to them, at our shop base at 79 Grand Parade, Green Lanes, N4 1DX. We sell them at our shop or through our Web Shop:- We sell all makes and types of Security devices through our WEB SHOP or through our shop in Green Lanes. From our shop in North London we cover all aspects of theLocksmith Shop Services,from standard key cutting to a full Master Suite. We sell every type of security unit, whether it is a cylinder or mortice deadlock, as well as UPVC units. We have both trade customers and customers from every other sphere, visiting our shop from the whole of North London and North West London and further a field, to use our Security skilled services. We have become known as the Security Shop of North London Our Security Shop Service are agents for most leading makes of lock manufacturers and a main dealer for MUL-T-LOCK we can cut their registered keys, with the registered card. Our Security Service offer a Shop Services, to cover all of the trade, we will always try and help you find what you want. WHAT ELSE CAN WE DO WHICH WILL SAVE YOU MONEY AND MAKE YOU ANOTHER ONE OF OUR HAPPY CUSTOMER. 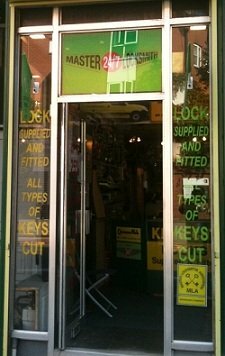 * We can repin Mul-T-Lock cylinders and cut keys to your card. * Cut keys to ignitions when keys are lost or stolen. * Cut and chip TRANSPONDER keys. * Repair, Replace and Retail UPVC units. * Copy and cut keys to Ingersoll, Chubb, Yale, Union ctc. THE NUMBER "ONE" SECURITY COMPANY FOR LOCKS. All security items can be purchased through our WEB SHOP. If you would like an estimate on any work undertaken by Security Service, including our HOME SECURITY Services, please fill in the form below and we will contact you as soon as possible, alternatively telephone our office on 0208 800 6041 and we will be happy to give any advice you require.